I am involved in rather a lot of different flavors of historical dance, and with these web pages, I will share some sources and observations which I hope may be helpful to those with overlapping interests. The pages cover the periods I will lump under "Regency" (more like 1800-1820 rather than the actual span of the English Regency), "Victorian" (1838 - 1901), the "Ragtime Era" (1900-1920) and the "Jazz Age" which I will arbitrarily define as 1920-1945 - heck, all these definitions are pretty arbitrary, but they are a convenient short hand for particular eras of American and European dance. In keeping with my personal priorities, I will focus on basics and fundamentals rather than specific routines and novelties. My first priority has always been providing accessible means for as many people as possible to get out on the dance floor and participate. 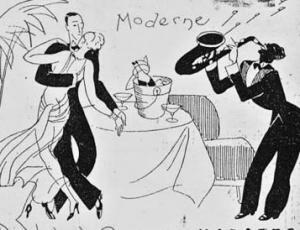 My second is to inform our modern dancing with documented historical content. I perceive the greatest need for this in Regency and Jazz Age dancing, where the usual practice in the 21st Century (at least in the places I dance) does not really capture the spirit or the letter of the dancing of the historical era. I would like to say though, that if I point out that the way you like to dance is not really historical, I am not telling you to stop doing it. All of us in the vintage dance or historical re-enactment communities cherry pick from history. We take what we find lacking in the modern world and leave behind the elements of the past that are best left behind. The same applies to historical dance. If you like to Waltz like a Victorian, you are not required to refrain from pivoting at a Jazz Age ball. You can always choose to dance your dance the way you like to dance. However, you should always make those choices consciously, and from a place of knowledge rather than from ignorance. Further, I think you may find that certain elements of historical practice, when incorporated into your style, make it richer and more interesting.